What’s the difference between condo common charges vs co op maintenance fees? Why do some NYC apartments for sale list maintenance while others list common charges? We’ll go over everything you need to know about condo fees and co op maintenance charges in this article. We’ll also explain what your monthly maintenance fee covers and what the average maintenance cost for a NYC apartment is today. What Are Condo Common Charges? What Are Co op Maintenance Charges? What Do Condo Fees Cover in NYC? What Does Your Co op Maintenance Fee Cover? What Is the Average Maintenance Cost for a NYC Apartment? Is There a Condo with No Maintenance Fee? How Are Common Charges and Maintenance Divided? Apartment maintenance is an unavoidable fact of life for city dwellers who own their own home. If you have neighbors in your building in NYC, then you most likely own a condo or a co op apartment. Your building’s board will create the co op or condo operating budget which will be paid for collectively by all the owners through a monthly maintenance fee. This maintenance fee will usually be split proportionally and fairly among the condo owners and coop shareholders, typically dependent on the amount of square footage their apartment has and other factors such as floor and outdoor space. Condo common charges are different from co op maintenance charges in that property taxes are not included. Because condominium owners are holders of real property, they are taxed individually by the NYC Department of Finance. As a result, they’ll receive a property tax bill by mail1 and will need to either pay directly or via their mortgage lender. If they have a mortgage, their mortgage broker or bank will usually set aside part of their monthly mortgage payment into escrow specifically for NYC property taxes and pay it automatically on their behalf. To summarize, condo common charges are what condo unit owners pay as their monthly maintenance fee for the shared upkeep of the condo building. They do not owe anything further for upkeep, but must pay their NYC real estate taxes separately. 1You can also find the property tax bill for any property online, check out our list of useful real estate websites in NYC in our directory. 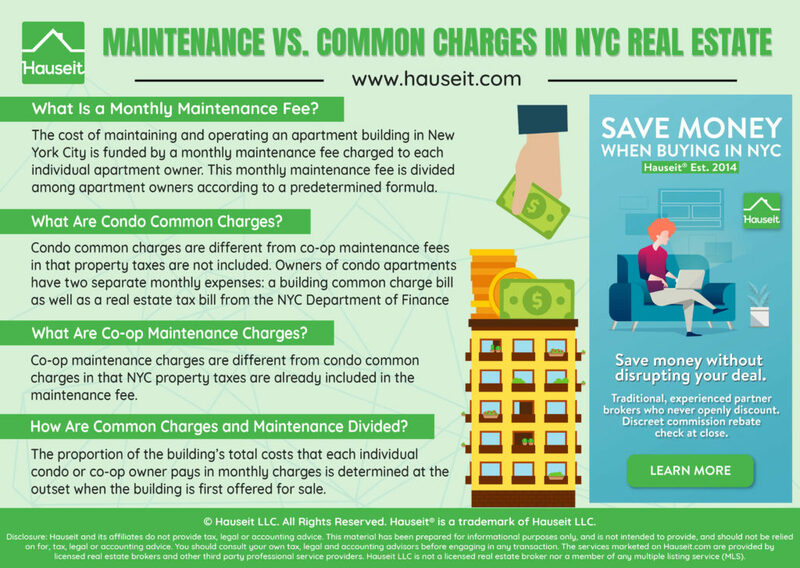 Co op maintenance charges are different from condo common charges in that NYC property taxes are already included in the maintenance fee. Because coop apartment owners are technically shareholders of a corporation that owns the entire building, they are not paying property taxes since the coop corporation is the real estate owner. As a result, they indirectly contribute to the payment of the building’s property taxes through their co op maintenance charges. Co op shareholders will receive a co-op tax deduction letter, also known as Form 1098, by January 31st of each year. This coop tax deduction letter will inform the shareholder exactly what portion of the building’s real estate taxes and mortgage interest they paid in the prior tax year. To summarize, the co op maintenance fee is what coop apartment shareholders pay as their monthly maintenance fee for the shared upkeep of the co-operative building as well as their share of the building’s NYC property taxes. They do not owe anything further for upkeep or for real estate taxes. Condo fees cover the cost of maintaining the building in good condition as well as select utilities, such as water and natural gas. Your personal electricity use and home internet is usually not covered. If your condo building has a doorman in addition to a superintendent or other building staff, your condo fees will cover the cost of their salaries. Your condo fees will also cover the building’s insurance policies, permits, licenses, fees and supplies. Check out our sample condominium budget article to see what a typical condo budget looks like for a building in Lower Manhattan. Keep in mind that for bigger repairs such as installing a new elevator, your condo board may need to levy a large one-time assessment in excess of your regular condo monthly fees. However, condo boards try to minimize disruptive surprises such as large assessments by contributing a portion of condo maintenance fees to the building’s reserve fund each month. This line item is called a capital reserve contribution in a typical condo budget. Your monthly maintenance fee paid to your co op covers the upkeep of the building as well as certain utilities such as water, natural gas and sometimes even heating1. However, your personal electricity use and your cable TV or home Wi-Fi will typically be your own responsibility. If you live in a doorman building, your monthly maintenance fee will cover their salary in addition to the salaries of other building staff such as porters and the superintendent. Your maintenance fee will also cover the cost of the building’s insurance policies, any income taxes of the co op corporation, accountant fees, legal fees, landscaping fees, exterminator fees, supplies and snow removal fees. A responsible co op board will also try to set aside a portion of the monthly maintenance fee aside as a capital reserve contribution. Lastly, please remember that your monthly maintenance fee also helps cover your portion of the building’s NYC real estate taxes, as well as the building’s monthly mortgage payment if the co op corporation has a mortgage on the entire building. As with condos, you may face an unexpected one time assessment for larger projects such as Local Law 11 inspections and façade repairs or the replacement of a building boiler or roof. Even though co op boards will try to budget for repairs in the monthly maintenance, they may need to dip into their capital reserve fund for larger projects or levy a large one time assessment on all the shareholders. 1Especially if it’s an older co op building which heats all of the apartments via central steam heating via pipes in the walls. The average maintenance cost for an apartment in NYC has steadily risen over the past couple of decades, mostly driven by steadily increasing NYC property taxes, along with sewer, water and other utilities costs. As a result, many New Yorkers in neighborhoods such as Boerum Hill in Brooklyn have had to move out of the city as their property values and maintenance have skyrocketed over the years. The average co op maintenance per square foot has increased from roughly $1 per square foot in the 1990’s to approximately $2 per square foot in the 2010’s. That means for your run of the mill 1,000 square foot co op apartment, your monthly maintenance cost went up from $1,000 a month to $2,000 a month or more today. 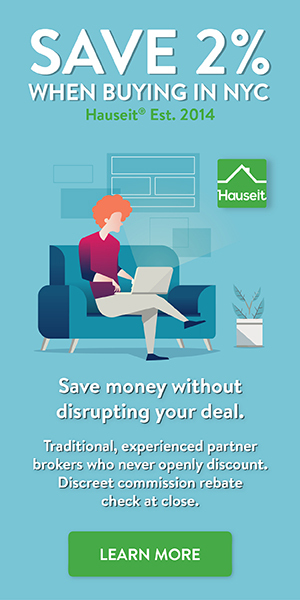 According to a 2018 Hauseit survey of real estate professionals and our partner brokers, the average monthly maintenance for coops in NYC today is roughly $2.50 per square foot. That means you can expect a monthly maintenance payment of $2,500 per month for a normal 1,000 square foot coop apartment. That’s quite an increase! There is no such thing as a condo with no maintenance fee. If there was no maintenance fee, who would pay for the upkeep of the building? Furthermore, the building would pretty soon have a lien from the NYC government for unpaid water and sewer charges. Therefore, you can’t just let a building deteriorate even if you wanted to as you need to pay for basic charges like water, sewer and garbage collection. To summarize, a condo with no maintenance fee does not exist in NYC because the building needs to at a minimum pay for basic municipal services like sewer, water, and garbage collection. As a result, a frugal group of condo owners in a building would still have to have a minimum monthly condo maintenance fee to pay for these basic city services if they don’t want a government lien on their building. Buying? Estimate what your closing costs will be with our Closing Cost Calculator for Buyer in NYC. Selling? Get a sense for what you’ll have to pay in fees with our Closing Cost Estimator for Seller in NYC. The proportion of the building’s total costs that a condo or co op owner pays in monthly charges is determined at the outset when the building is first constructed. In a new construction project, a 339-i letter, otherwise known as a Fair Allocation Letter, is filed to determine the allocation of monthly charges for each unit. New York State requires that the person filing this letter and making this determination is experienced in real estate and is not economically affected by the choices made.1 However, in practice the person writing the Fair Allocation Letter is pretty much always picked by the sponsor. With that said, New York State does have some criteria or guidelines on how common elements for condo owners, and thus common charges, should be allocated. The biggest criteria as you can imagine is square footage. Higher floors matter as well, though this doesn’t have to be a straight line formula. The person writing the Fair Allocation Letter has discretion to make non straight line adjustments. This might make sense if the view breaks on a certain floor for example. In a new construction condo, the percent of common elements that are assigned to you stays fixed just like the number of coop shares. This percent of common elements owned will not change for condo owners unless they buy common areas like the hallway in the future. Not only will the percent of common elements owned affect what share of common charges you will owe going forward, it’ll also affect how much in property tax that you pay. 1Per a memo from the NYS Department of Law dated May 14th, 2014, Section 20.3(i) of the regulations requires that the offering plan: include an opinion from a licensed real estate broker, appraiser or other expert who does not have any beneficial interest in the sponsor or in the profitability of the project. The opinion must be signed by a duly authorized signatory or by the firm and must state: 1. What experience the broker, appraiser or other expert has had with offering plans and with selling cooperative or condominium units and other relevant expertise. 2. The method selected pursuant to Real Property Law Section 339-(i) or applicable state law and the factual basis for calculating the percentage of common interest in the condominium under that method.